On Sunday I attended and presented at Podcamp Halifax 2019! What is Podcamp? Don’t be fooled by the name (as I was). Podcamp isn’t podcast based (although there was lots of discussion around podcasting). It’s an “un-conference” about all things digital media! There were sessions on social media, podcasts, virtual reality, data protection, and more! There were sessions being held simultaneously – with about 7 slots throughout the day, and 4 options each time. I generally chose to go to sessions of people I know – 1. to support them, and 2. because I knew they would be good. She discussed the 5 second rule – I thought that was for when you drop snacks on the ground – but apparently its an idea by Mel Robbins, and you have 5 seconds to do a thing before your brain talks you out of it. So if you see someone you want to talk to or introduce yourself to, start walking towards them before 5! Look for groups of 3 during a networking event. One person is probably the odd man out. Simply Ask. Even if you are chatting with someone who isn’t a potential customer, they probably know someone who is. Ask: do you know someone who needs help with ____. 2. Kerra Aucoin – Kerra is an old friend of mine and I’d never seen her speak, so I attended her session. Even though there was no new information for me (she talked about social media) I think it’s always great to pick up some tips and look at things from different perspectives. There were some great reminders for me. 3. Mike Tanner – This session was about podcasting. Do I have a podcast? No. Am I planning on taking the audio from these videos and creating a podcast – YES! That is on the agenda for the spring – so stay tuned for that! And this session was great for someone considering podcasts or just starting out. Alright so I talked about, you guessed it, video marketing – so I talked about stories, live video, and pre-recorded video. But let’s rewind. A few months ago, my friend Brittany bought me a “gift” which was a unicorn headband. She kept forgetting to bring it to me everytime I saw her and finally on Sunday she remembered. I had to put it on right away – obviously. But then everyone asked if I was going to wear it while I presented – so I said yes. And well anyway long story short, I ended up putting them on briefly during my presentation. Everyone laughed, took pics, I took them off, but everyone continued to laugh throughout the entire presentation – which is good – I enjoy laughter. Overall the presentation went well – my audience was into it, asked lots of great questions, it was great. I love presenting. It’s more fun every single time. I had a few people approach me after asking for my info because they wanted to get me to present for their organizations – so if you want me to present for you, fee free to reach out! -Halifax is far – although I suppose that’s my own fault, but why isn’t there a train? Can someone buy me a private jet? -Oh and I guess – 45 minutes is short to present something – but again, that’s the standard. -Also, note that all the good Timbits were gone when I got there. Overall, a great event that I’d recommend to any entrepreneur! See you all next year! Live video gets 600% more engagement than other types of video (and let’s face it, video in itself gets more engagement than other types of posts). Live Video is watched for 3 times longer than pre-recorded video. AND Live videos have a 148% higher reach than any other form of content. It’s the closest you can get to face to face interaction. How can you leverage the power of live video to grow your business? In this free guide I explain everything you need to know before hitting the big red LIVE VIDEO button! As a social media marketer, there are a lot of bad habits I observe online. Sometimes they are habits of some of my own clients, entrepreneurs that I speak to, or people that I follow on social media. But the point is, they frustrate me – and more importantly, they could be preventing you from growing you business more effectively. I want to help you make sure you are not continuing with any of these bad habits into 2019, so that you can have your most impactful year yet! The first bad habit I want to talk about is winging it. And I’d say most of us are guilty of having done this at one point of another. And this is what happens when you don’t create a social media marketing strategy to guide all your efforts. The great thing about creating a social media strategy, whether it’s with a social media marketer, such as myself, or even on your own, is it forces you to make sure that you are looking at the big picture and planning your content and presence strategically. What happens when you don’t have a strategy is you say, oh, I haven’t posted to social media for a few days, better do that now. Then you log in, stare at the blank post box, and nothing. OR, weeks go by, and you haven’t posted anything, and you think you need to post something, so you post something crappy just to say you did. Your potential customers need to know what you offer, and how you can help them accomplish their goals. That’s a given. But to move your audience from potential customer, to paying customer, they need more than just that. Your audience has options – there are lots of companies out there offering the same thing, or something similar. This is where it’s important to share about yourself beyond what you sell. This helps your audience connect with you, start building a relationship with you, and you will eventually gain their trust. That connection point is far too often overlooked by entrepreneurs. In your business, it’s important to be clear and specific about who it is you want to work with. And really, this is your decision, you can work with whoever you want to work with. BUT you can’t work with everybody, and even less so, you can’t target everybody. When you try to target everybody, or if you are generally too broad in who you are trying to attract, you message gets diluted, AND your content is much less effective. Your audience will be more inclined to work with you when you are talking directly to them. But the broader you try to go, the less people feel like you are talking directly to them. So, specific is always better. Turkey sandwich, 8.99. Upcoming event get your tickets now. Enrollment is now open for my course, buy today. You know when you check your mailbox, and you get a bunch of flyers or coupons, or letters promising better internet? And then, if you are like me, you proceed to dump all of that into the recycling bin beside the mailboxes? Well, when I open up my social media, I don’t want to see promotions like that. Spamming your audience with daily promotions is a quick way to the unfollow bin. A good rule to follow is the 80/20 rule. And this means that you are sharing 80% valuable content, such as tips, stories, personal things etc, and then 20% can be on the promotional side. The last habit I want to discuss is content dumping. As for a definition: content dumping. Verb. The phenomenon of publishing content and wishing for engagement, but not sticking around long enough to respond to comments or questions. This term can also extend to mean not engaging with any other posts either. Ok, I made up that definition. I used to like that game Balderdash. But the point is – if you are looking for engagement, it’s a given and take kind of situation. If you are expecting your audience to comment on your posts, you need to be there to respond to that. This build more trust. If you prompt them to ask a question, and you never answer it or respond, then you lose trust. Take the time to respond to any comments. Even something as simple as a thank you can go a long way (although bonus points for something more specific). And while you are there. Take the time to comment on the posts of others. Social media is a 2-way street. Its important to show others that you care if you want them to return the favour. For many entrepreneurs, creating content for social media has become a way of life. We create regular content to educate, entertain, and engage our audience. Creating great content can increase our visibility, build relationships, and attract new customers. But every once in awhile, we get into a rut. You might not know what to say, you might feel like you’ve said it all before, or you might feel like the ideas you are coming up with aren’t going to serve your audience. Have you ever felt that way? I know I do from time to time. One mistake I often see entrepreneurs make is creating entirely different content for each platform and for each day. Kudos to them for creating so much content, but it really isn’t an effective strategy. The goal should be to get more eyes on your content, not create as much content as possible. How do you do that? Look at the big picture of what’s going on in your business at the moment. What are the key initiatives this quarter? The content that you create should be in line with those initiatives. For example, if I am about to do a launch of the Live Video Formula, my live video training, my anchor content (which for me is my live show) will be about live video. Taking that a step further, I would also repurpose some of the main points of that video into static social media content. I might also take one of the topics and go into further detail in an Instagram story. The point is, you want a cohesive strategy, not 5 random posts about 5 different topics. The videos you create are for your audience. That means no one knows better what type of content you should share than your audience! But they aren’t going to outright call up and say, “Hey Denise, you should do a video on FB Stories” (unfortunately). But if you keep your eyes out, it’s ALMOST that simple. If you ever do speaking gigs, pay attention to the questions that your audience asks, both during the official Q&A, and any questions that they may come up and ask afterwards. If someone asks it, others are thinking it. It’s a clear sign that people want to know. You should also keep an eye on any questions that your audience asks on social media. If part of your problem is that you haven’t done many speaking gigs, are people are asking you questions, then do some research! Look up questions that people ask in relevant Facebook or LinkedIn groups. Or look up influencers in the same industry as you, see what people are asking them. Why do your customers buy from you? I’m sure you can come up with all sorts of reasons, but the most important one is because you are you, you’ve built a relationship with them, they like you, and they want to support you. Therefor, who you are is a vital piece to your marketing. Yet, most content creators censor their personalities. But this isn’t High School. The goal isn’t to fit in, it’s to STAND OUT as much as possible, and that means being your unique self. Make sure you infuse your personality into every piece of content that you create. But, it’s not about you. It’s about your audience. Whenever you are creating content, you need to do so with your audience in mind. That means when you are sharing stories, you aren’t sharing them just because, you are sharing stories that are relatable, and can emotionally connect with your audience. Your goal is to be the guide. You are the expert in what you do, and its up to you to help your customers achieve their goals. You are the fairy godmother in the story, and they are the princess. You need to get them to the ball! If after doing all of this, you still have nothing meaningful to say. Don’t say anything. It’s much more important to share quality posts than just posting to say you did. Creating crappy posts that don’t get engagement will do you more harm than good in terms of the algorithm and the perspective of your audience. By posting things just for the sake of it you will get filtered out, and the algorithm will decide that users don’t want to see your posts. So, if you have nothing nice to say, don’t say anything at all. Hope you had a fantastic Holiday, and are looking forward to 2019, I know I am! This episode is inspired by the fact that every time I hire someone to help me with something in my business, my thought almost instantly becomes “I wish i’d done it sooner! When there is something that I don’t like doing, really don’t have the time to do, or am just not good at it, it starts to get heavy and stressful. And extra stress is obviously not something that I want, and I assume that you do not either. A few weeks ago, sometime during the holidays, I just exclaimed to Kiel “WE NEED TO HIRE A HOUSEKEEPER!” I like having a clean house, but I don’t necessarily like to clean. We both work full time and have other activities that we like to do. Meaning that we are essentially only keeping up with the bare minimum around here. We went forward and found someone to come in on a regular basis. From the minute she stepped foot in my house, I could feel a huge weight being lifted off my shoulders! Something that was going to get done, that I didn’t need to worry about doing. OR worry about seeing dust bunnies floating along my hallway. I couldn’t help but think – I wish id done it sooner. And then I realized, that every time I hire someone or outsource something, I get that same feeling. But being able to take things off my plate is an amazing feeling! Things magically get done without me having to do them! It’s so worth it! The first thing I ever outsourced was my bookkeeping. I muddled through doing my own bookkeeping for years! And basically my process was this – ignore all of my bills and receipts and such, and then when it was time to pay my quarterly HST, frantically try to get it all in, get confused when things didn’t add up, waste time trying to remember what went down those last 3 months, try to understand how much I owed, then I paid it, and vowed to keep up with my books better so that the same thing didn’t happen next time. And then next time came around and I did the exact same thing. At a certain point, it became not worth it to do my own books. Because I had less and less time, and the time I wasted trying to sort things out would be better spent working on things that make money, so that I could hire someone to do it for me! Great decision. I wish I’d done it sooner! I know how it feels to feel like you are the one responsible for everything in your business! But even if you are a business of 1, it doesn’t mean that you need to take care of every little detail. Your time is best spent in your zone of genius. And for me that means having the vision for my business, spending time with my clients, and creating strategies and content. Most other things can be taken care of by someone else – and that definitely something I will keep in mind this year and going forward. So, if you hate bookkeeping; outsource it. If you don’t have time to create content for social media; outsource it! If you need help keeping up with daily tasks; hire a VA. You don’t need to go at it alone. Its your job to focus on the things you are great at! Ready, Set, LIVE! What you Need Before Hitting the BIG RED Live Video Button! Hello fellow (or aspiring) live video creator! Applause for taking action on stepping up your live video presence in 2019! Live video is my favourite way to share content with my audience. And honestly, it has helped me exponentially grow my business. How? Well, live video gets 600% more engagement than other types of video (and let’s face it, video in itself gets more engagement than other types of posts). Live Video is watched for 3 times longer than pre-recorded video. AND Live videos have a 148% higher reach than any other form of content. Business has been built on relationships for thousands of years. That doesn’t go away because of social media. It just means that instead of building relationships on the golf course or over martinis, they are built online. And live video gives you the advantage. Your audience can see and hear you, as well as the nuances such as the tone of your voice, your facial expressions, and your hand gestures. It helps you gain the ever coveted know, like, and trust factor faster than any other type of content. Now how do you make sure that you are positioned to use live video to get more visibility, more leads, and more customers for your business? Read on! Let’s grow your business with live video! Before you go live, you will want to identify a theme for your show that you can speak on. The theme should be in line with what you help people with in your business. To choose your theme ask yourself: what am I an expert in? Or - What do I want my audience to see me as an expert in? This should help you choose your show theme. For example, the theme of my show is social media marketing (with some shows on the broader topic of online marketing) but the point is, the show is for entrepreneurs who want to improve their social media marketing and learn new tips, tricks, and strategies. What should I talk about on my live show this week? This is a question that plagues entrepreneurs. There’s no point in talking about random topics every week. The goal should be to get more eyes on your content, not create as much content as possible. Look at the big picture for your business. What are the key initiatives this quarter? The issues and challenges you discuss should be in line with the initiatives and seasons of your business so that there is some cohesion to your content. For example, if I am in a season of promoting my live video training, The Live Video Formula, the content I share will be on the topic of live video. At that point I am not going to talk about things like Facebook Ads, Instagram Strategies, or really anything that isn’t in line with live video. Aside from that, everything is optional. A few things that can make a huge difference in how your videos look and sound are a mic, lighting, and an external webcam. When in doubt, keep it simple! Tip: It’s always a good idea to close any unnecessary applications, or even give your laptop a restart before going live! What will be in the background of your video? If you are planning on creating a regular live show, you will want to set up a background that reinforces your business and brand, captures the attention of your audience, and is unique to you! Creating your set background is a great opportunity to show off some of your personality, so feel free to use props that mean something to you. An office setting can work really well, or even a bookcase. Add in your brand colours, and any relevant props. For example, I have a bookcase with some props in blue. I also have and @ symbol in my brand colour. How do you get people to watch your live video? You need to tell them when you will be live! The more people who watch live the better. It gives you more people to engage with, and it tells the algorithm that people want to see your video, which will result in more reach. 2. If you are just getting started and are a bit hesitant about going live, announcing it forces you to ACTUALLY DO IT because you are now accountable. You can schedule your video on Facebook and YouTube (or with any 3rd party software you might be using). Or you can simply publish a static post (on any platform) giving all the details of when you will be live. When you are on video, you want to look “put together”. I’ve seen people on both extremes. Some people are far too concerned with how they look, what their hair is doing, how their voice sounds on video, and that type of thing. This anxiety often keeps them from ever going live. But for the most part, no one is going to judge your video the same way you do or notice those little things. However, you do want to come off as professional. That means that you really shouldn’t be doing your video with wet hair, in your pyjamas or in a bikini (unless, of course, you sell pyjamas or bikinis). Consider dressing how you’d dress if you were meeting with a client. And that is different for everyone. Makeup? That’s up to you. I find I look washed out on video because I have lighting in my face, so I always wear makeup (and actually, I wear a touch more than I would wear out and about during the day). But it’s really about what feels comfortable to you! Going live can be nerve wracking! I know, the first few times I did it I felt super weird about it. Turning that video camera on makes us nervous. It’s an odd experience because you aren’t even talking to people, you are talking to a little circle. But, you are the expert in what you do, and you want to portray that with confidence! TRY to relax, have fun, and realize you are a big freakin’ deal! It doesn’t matter if you mess up. That’s the great thing about live video. Your audience knows you are live, so they are much more forgiving. And any little mishaps make them love you even more, because they see that you are human – and that’s relatable! By putting some planning into your show, and not worrying bout being in control of every little thing, you will come off as a confident expert! One thing that will make your life easier, and your content more engaging is creating a show sequence template that you can follow every time you go live. This will be a time saver and help you focus on what matters – your content! Come up with 3 to 5 main points that you want to talk about. Sandwich this between an introduction of who you are and what you are going to talk about at the beginning of the live. And, finish off with a recap, a call to action, and when they can catch you live again. When you create a live video, you amass all kinds of goodwill from your audience. This creates a perfect opportunity to leverage that goodwill by asking for next steps. For the longest time I didn’t include a call to action, and I’m sure I lost out on tons of leads. Always include a call to action, even if it’s simple. Most likely you will want to send your audience to an opt-in page. But sometimes it can be as simple as asking them to share you video, or like you page. Why are you going live? Having a clear answer to this question will help pull your through when you feel like you are in a slump. Sometimes I think “Ack, I don’t feel like going live”. But then I think about all the visibility I will miss out on if I skip a week or two. It’s ok if your reason *feels* selfish – growing your business, getting more visibility, attracting more customers. And it’s ok if it’s a bit more altruistic – to serve your audience. And really, it’s going to be a mix of various things. But think about that main reason that is going to keep you going week after week. I learned this the hard way. My dog is pretty mellow and had never caused me any issues in relation to going live. However, last year we got a kitten, and she likes to rile up the dog and they chase each other back and forth. I never really thought much of how this would impact my live videos, but I found out pretty quickly. There is a live video of me out there sharing information on live video, with a cat and dog running around the house, sounding like a stampede! So ever since then, whenever I am going to go live, I put the cat in the bathroom, or one of the bedrooms, and close the door. It ensures that I won’t have any cat stampedes going on in the background! 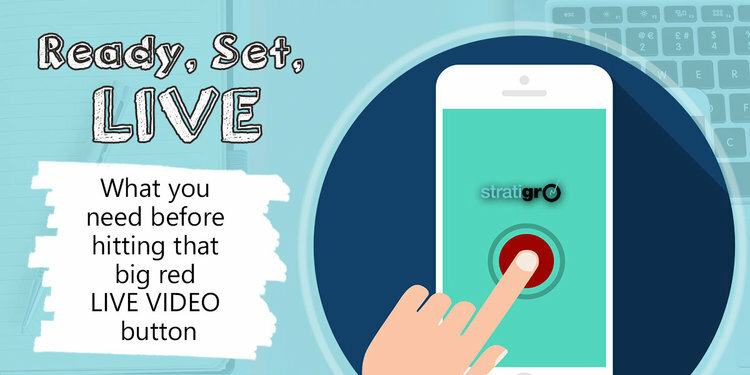 You have begun your live video journey and are now equipped with the tools you need to launch an effective live video presence that you’re your more visibility, leads and customers! These 10 things are going to get you started with live video on the right foot. And by applying even just a few of these your live videos will run much more smoothly! Holy Cow! Can you believe that we are into the final week of 2018 before the holidays? Time passes by so quickly when you are having fun (and hard at work)! This was a big year for me. I became a lot more focused when it comes to the type of clients I do my best work for and really doubled down on that. There was also a lot of work travel to places like the Bahamas, Arizona, California, Toronto (Ok – maybe the last one is not so exciting, but I went at least 2 times in 2018). I also launched my first online course, the Live Video Formula, which walks entrepreneurs through all the steps they need to create their very own live video show! There were also some big developments in the world of social media, like the bomb FB dropped on us with the whole Facebook Apocalypse (which wasn’t as awful as some anticipated), and the release of IGTV. Watch the video to see my “wrap up” of 2018! Do you ever struggle when it comes to putting words to paper? For more than 15 years, Kate Bonnycastle has been taking the agony out of business writing -- for the writer and the reader. Ad copy, web copy, sales copy, conversion copy & content. Her fave clients are already good writers who want to dial it up, so they can reach more people and make the world kinder, more inclusive and purpose-driven. - Why a school teacher isn’t the best person to review your copy. Corinne is a small business lawyer in Halifax, Nova Scotia, and has been giving practical legal advice to business owners and professionals since 2002. Corinne’s business, Legal Essentials Inc. provides an online community with legal tools and templates for Canadian women business owners. This is important because business owners don't know what they don't know about legal issues and there are very few Canadian legal resource tools online - many buy from US sources which are not usually appropriate. Being afraid about legal stuff can paralyze an owner and being ignorant of legal issues can introduce big risks. And protecting your business from risks. Know a business who is doing great things on Social Media? Nominate them for a Social Media Business Award! Nominations are open NOW and close November 29th at MIDNIGHT! Results will be announced December 13th. To nominate your favourites, click HERE. For Shaun Whynacht, small business is a way of life. In fact, the entrepreneurial spirit is practically woven into his DNA. As a small boy, he tagged along with his grandfather as he maintained a successful TV repair business. Later he helped renovate the kitchen for his grandmother’s cake shop, and all the while, his mother ran a craft business in his childhood home. Unsurprisingly, by the time he was in high school Shaun went into business for himself. Upon completion of his college studies in television production, he spent more than a decade exploring every corner of Canada and learning about the business world as an employee. From non-profits to corporations and revenue development to web design, Shaun has seen it all. - Why it's vital to record and organize your customer data.